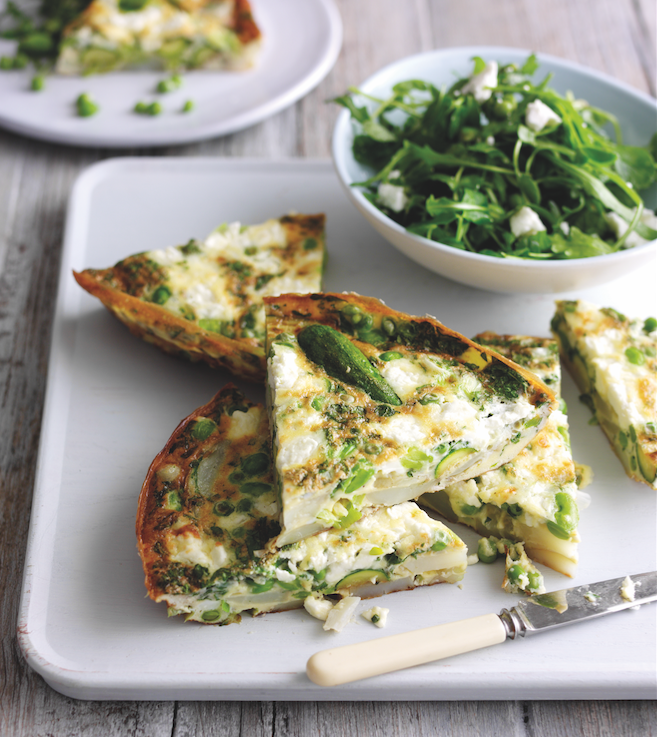 This quick and easy frittata makes the most of spring veg – it makes a great lunchbox option too! Cook the Jersey Royals in a pan of water for 12-15 minutes, until tender. Drain and, when cool, slice thinly. Cook the peas and broad beans in boiling water for 2 minutes (or 4-5 if from frozen) then drain and refresh under cold water. Whisk the eggs in a medium bowl with the mint, salt and pepper. Heat the oil in a 24cm non-stick frying pan. Add the courgettes cook for 1-2 minutes then add the potatoes, onions and garlic, cook for 3-4 minutes, until beginning brown. Stir in the peas and broad beans, keeping 10g of each for the salad. Preheat the grill. Pour the whisked egg over the vegetables and crumble over the feta, reserving 20g for the salad. Cook over a gentle heat for 10-12 minutes until almost set. Meanwhile, prepare the salad. Wash the pea shoots and rocket, dry well and tear into bite-sized pieces. Add to a medium bowl with the mint, reserved peas, broad beans and feta. Drizzle the leaves with the oil and a squeeze of lemon juice, seasoning with a little salt and pepper. Transfer the frittata pan to the grill and cook for 3-5 mins until the top is golden and cooked through. When the eggs are set, place a plate or board over the top of the pan so that the frittata falls on to the plate. Slice into wedges and serve alongside the salad.